MASIERO chooses an historical building for the 2018 FUORISALONE in Milan during the Design Week. Directly from the end of XIX century, an old print house comes back to life thanks to MASIERO installation. 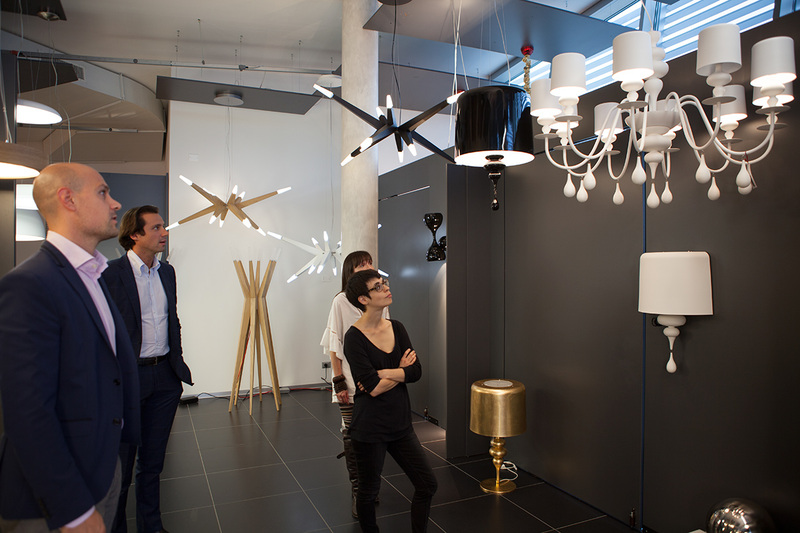 NAPPE, SKYLINE, HONICÉ and DAME, together with a revised version of SOUND and EVA standing lamps. One side of the inner room was lighted up by an innovative installation made with the RAQAM project by Marc Sadler. Last month Studio Salaris realized the 2018 MASIERO advertising campaign, with the art direction of Artemio Croatto (Designwork Creative Director). The shooting took place in an industrial property where the photographers by Studio Pointer built 5 different stages for 5 collections from the new DIMORE catalogue. Focusing on the contemporary style of MASIERO products, the stylist Alessandra Salaris drew the sets using few elements, and an evocative warm light that lets emotion flow form the lamps. MASIERO is proud to communicate the inauguration of its TEMPORARY SHOP IN MOSCOW that will stay open during both october and november. MASIERO will show the best of all its historical classic collections and a special selection of the contemporary news that unite innovative design and Venetian tradition, inside a post-industrial building with visible bricks and pillars. Between the exposed products, inside a mixture of lights and colors, we can find also Raqam e Sound that are the two principal news, presented for the first time at Euroluce 2017 and realized by the designers Marc Sadler, who recently won the prize for Lighting Designer of the Year, and Giovanni Battista Gianola. An hallway of lights realized by the decorative use of Raqam will carry visitors inside the spaces, to gradually immerse them in a bright spiral and a precious chandelier. Maria Teresa, productive cornerstone of Masiero, perfectly reflects how this brand is able to connect both the venetian tradition and the innovative technology LED RGB-W. Moreover the open space will be full of all the other Company's iconic pieces, presented in a lights and pastel drapes sequence. Opening times: mon-fry from 11.00 a.m. to 7.00 p.m., Saturdays only by appointment. The opening party on Tuesday, October 10, will host Elle Decor Magazine as media partner and will also wellcome the designer Marc Sadler. The temporary showroom will be open until November 30, and it will be the meeting place for lighting professionals, architects and interior designers who will have the opportunity to experience MASIERO's authentic soul. Some of the most representative pieces of the new collections will be exhibited, along with unusual installations designed both for residential market and for the most demanding personalized projects. Following the great success recorded in the previous European editions, MASIERO will be present at the two Italian exhibitions in ROME (October 11 and 12, STAND 54) and MILAN (November 29 and 30, STAND 128) with its own stand. MASIERO has been also chosen by the Architect@Work organization as the Official Lighting Partner of both editions. The central hall of the fair will be lit up by a Marc Sadler installation made with the modular product RAQAM, the revolutionary project that MASIERO has developed specifically to allow light professionals to illuminate any space without size or shape limitations. Seven elementary modules for infinite combinations. Milan proves to be the capital of design, both for the richness of the proposals, both for the freshness and dynamism that can be felt around the pavilions. A definitely positive balance for MASIERO that, over an area of 550 sqm, has shown, in addition to some of its most successful collections, the innovative RGB-W LED system Maria Teresa chandeliers, and two novelties that have intrigued and fascinated visitors. More than 70 agents from all over the world came together last December for the traditional MASIERO convention to take stock of the goals achieved during 2016, fix the objectives for 2017 and see a preview of the products to be launched during the Euroluce 2017 exhibition. Don't miss the chance to visit us at the exclusive Architect@work. We are working on the new institutional video. Stai tuned and follow us on Facebook. Mosca hosted our stand at the fair “ISaloni Worldwide” from 12th to 15th October at the Crocus Expo Center. The usual warmth welcomed MASIERO, now home at the Crocus Expo, where thousands of visitors crowded the most important event for the Made in Italy and beyond. With its 100 square meters island, MASIERO stood out for its elegance and refinement, in his "all-white" stand where the best sellers and the icons of Classica and Eclettica stood out. In the heart of the stand were four chandeliers of the Maria Teresa collection, in the hi-tec RGB-W LED lighting version, which gave freshness to the stand in the magic of colored light scenarios. Th e best interior designers posted their visual mood for interiors made with Masiero's lamp. Would you like an installation Masiero? All Masiero chandeliers are made entirely inside the Venetian district. Design and production processes both take place at the same venue. For this reason we offer 100% Italian product under an unparalleled quality. It also allows us to go very far in customization. Even the imagination is a limit! We are able to combine individual lamps as if they were modules of a large art installation so we can characterize great spaces in villas and hotels giving you amazing lights effects. 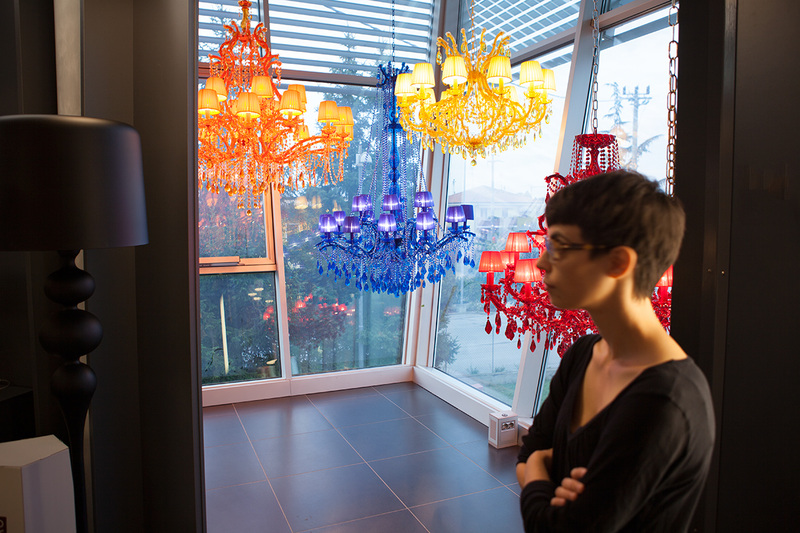 From the ancient enormous chandeliers to modern and contemporary installations. We've collected some of the projects we've done on commission in recent years in order to help the most demanding customers to view the best lighting solution. Follow us on Facebook, Tumblr and Pinterest and collect all of them! Attended by over 150 guests including customers, interior designers, architects and lighting professionals, was held on June 1st in Kiev the presentation of the new MASIERO LED RGB-W patented technology, adopted on MARIA TERESA traditional chandeliers and on outdoor lights of the DRYLIGHT® line This meeting is the first of a series of meetings organized by MASIERO for the launch of this innovative solution, and the upcoming events are MOSCOW and SAINT PETERSBURG in July. MASIERO commercial branch in Abu Dhabi was officially inaugurated on June 6th. Along with Dubai, the capital city of the United Arab Emirates is the financial hub and investment landmark of the whole area of the Middle East and Southwest Pacific. The President Mr Paolo Masiero and the CEO Mr Enrico Maria Masiero, cut the ribbon in the office located within the Abu Dhabi Business City, entrusting its management to the Branch Managing Director Tiziana Greco, formerly MASIERO exports manager. Some inspiration for your outdoor wedding under a century-old acacia tree, a porch or a tent. No matter what, you can always count on Drylight. Drylight by Masiero had been the star at the Wedding Party at Villa Valier on the Brenta Riviera, the Venenice's traditional countryside. Antico Atelier made the perfect Rococo atmosphere. There is no doubt that Dubai is one of the most technological cities in world. Because of this innovation lifestyle we'll be at INDEX International Design Fair. It's one more spotlight on the biggest designers and architects in the world. More than 50 participating countries will display their 720 products in 19 halls. You can only find the world's best innovations including our various and numerous eclectic creations, Drylight, and Classical. Index Dubai, from May 23th to 26th 2016, hall 8 stand 8A21. A rigorous and elegant stand, representative of MASIERO style all around the world, welcomed visitors of the last edition of the International Design Exhibition held at the Dubai World Trade Centre from May 23rd to 26th. Among the most appreciated creations, the big MARIA TERESA in LED RGB-W version, the customized versions of EVA and CHIC in an extra large configuration, in addition to the composition made of 10 suspensions of the LIBE collection that overlooked the reserved area. The corner dedicated to DRYLIGHT was really impressive with a 12 sqm large LEDWALL that allowed the visitor to dive into the various outdoor environments in which the chandeliers can be placed. Jordana Green is a US journalist and Mark Grossfield entrepreneur's wife. The couple is renovating a large and luxurious home in Minnesota where they'll live with their four children. Here Jordana will conduct her radio transmission for WCCO every night from 9 to 11P.M. Masiero's chandeliers are the lighting protagonists. The restoration, included all the interior design choises, are presented in a reality show and a television broadcast. The couple tells their meeting story, and the project about the new house, in this interview for the St. Louis Park. Take a look to the episodes at this link. The american journalist Jordana Green and her husband Mark Grossfield chose Masiero chandeliers for their new home in Minnesota. The restoration will be the subject of a television program discovering the most beautiful homes in the US. We'll see Flashwood in the great hall, Libe lamps on the island kitchen, Olà will dominate the table of the dining room and Virgo the kids' rooms. We can customize our lamps in any colors you like more! These colors are also the same nuance of our light crystals of Olà. We are in Kiev at Interior Mebel from 17th to 20th February 2016. Living in Frankfurt means to have the chance to see the biggest Biennale of light culture. During the fair also Luminale comes to light with 170 installations and performance. The leitmotiv is the classical aesthetic mixed with futuristic technology. The Trend Forum, hall 5.1 and hall 6.1, presents all new trends. Both artists and companiews will face future in the name of innovation. Masiero takes place in this field with its home automation applied to its lamps with a new classical design. Come to vist us at our stand during Light&Building to try the new app Masiero Smart Light : it is a real innovation in the field of outdoor lighting. Indeed, this application enables the customer to control the on/off and dimming functions in remote, as well as to individually manage or to synchronize the colors and the color scenarios of all the lights in a home. This technology was originally developed for DRYLIGHT, MASIERO’s renowned outdoor collection of Venetian style chandeliers, which incorporates two international patents. In fact, the DRYLIGHT collection is made with IP65 certificated materials and technologies, which guarantee strength and impermeability in all outdoor applications. Its latest version uses the dimmable RGB-W LEDs according to the DMX protocol or Wi-Fi control. Moreover, this Wi-Fi application for smartphone and tablet that runs on Android and IOS operating systems, is now available for Masiero’s indoor Venetian style chandeliers with RGB-W LED lighting, allowing full control of spectacular colored lighting scenarios inside and outside any location. To get more info visit Light&Building . 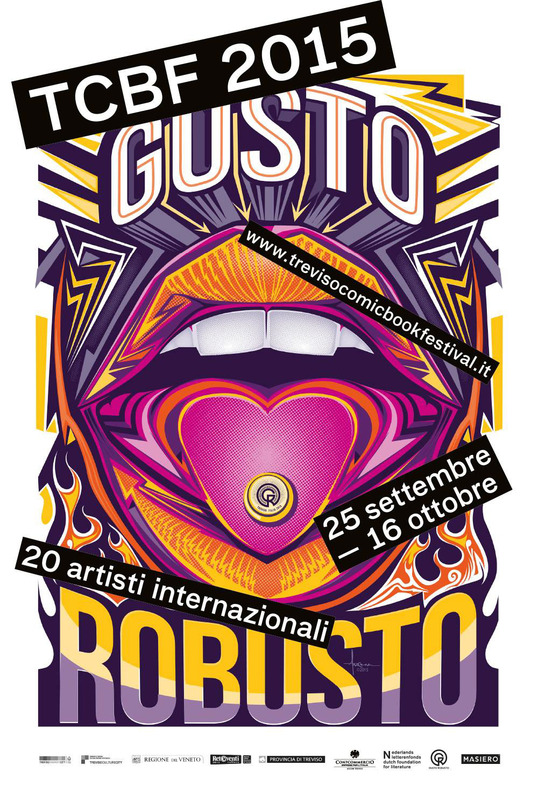 Masiero is the main sponsor of the exhibition "Gusto Robusto. Vectorial art prints" during TCBF2015 curated by David Sossella. Because of this partnership, Gloria Pizzilli draw "Crystalline", a special limited edition thinking to its values as light and suspending in time. The company will use this artwork for its marketing. "Seta" by Gloria Pizzilli. Gusto Robusto second Series May 2014. 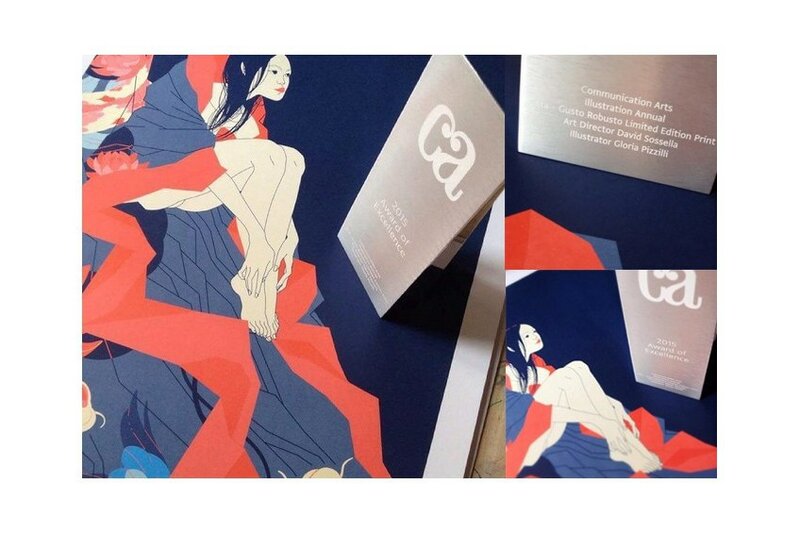 It won Excellence Prize of Communication Arts in 2015. Gloria Pizzilli at Masiero's showroom is presenting for the first time her tribute to the company. Until 15th December you can try to win a "Crystalline"! 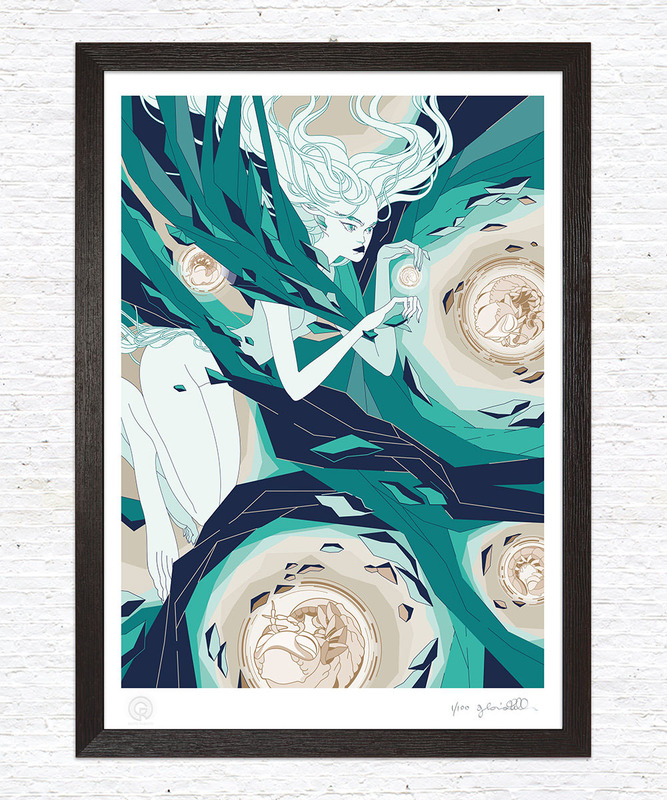 You could win "Crystalline", a limited edition artwork by Gloria Pizzilli (numbered and originally signed in 100 pieces). Download the Kit with template image and instruction at this link to draw all around Mabell. You can choose your own technique (digital or not). Just send the file or scansion to web@masierogroup.com within December 15th. The jury composed by Masiero's representative, the illustrator Gloria Pizzilli, Gusto Robusto and TCBF. 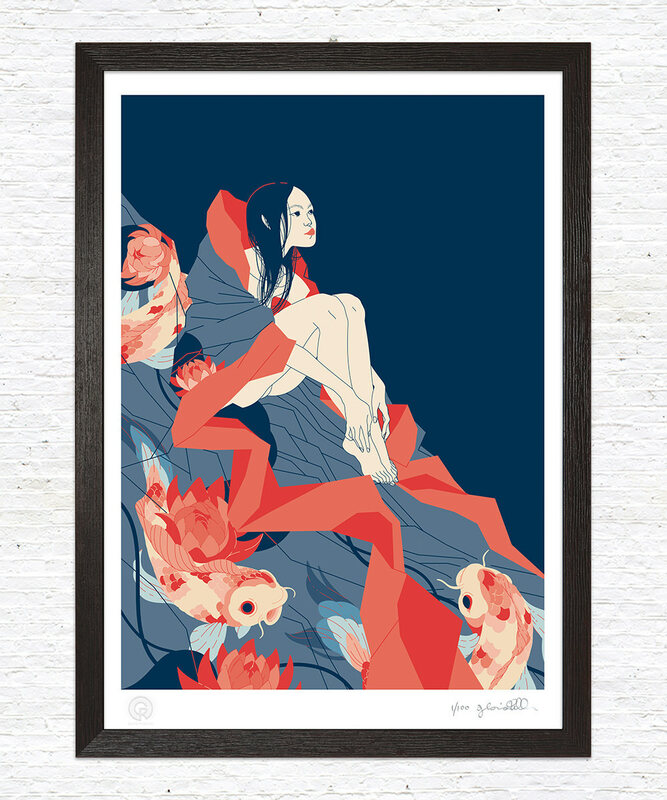 Before Christmas we'll announce on our Facebook page the winner who will recive the artprint. The most original drawings will be pubblished on our socials so, please, follow us by clicking ILike on Masiero's page! Thanks to Drylight the magnificent of Granai della Repubblica comes outside as welcome for visitors at Mercatino dei Granai Zitelle that hosts at Belmond Hotel Cipriani the best oof design and artcraft. The blogger Anna Rado is Masiero's correspondent in Milano during Design Week, from Salone to Fuorisalone. In the gallery her pictures about city lights also in the new areas built thinking to Expo 2015. A mood composition shows inspirations about life style in the capitol of fashion and design. Here the reportage of her experience at Masiero's stand at Milano Rho. The entire city is excited because it's Design week and also because Expo 2015 will open in few months. In Piazza Duomo and Galleria Garibaldi is always daytime; during this week areas as via Tortona and Brera neighborhood turn on. This year new lights shine: the EXPO Gate, just in front of Castello Sforzesco, and also along Navigli river because of the new Darsena. 2015 seems to belong to Milano! It's the most innovative city in Europe thanks to new place as Gae Aulenti square or the prizewinner building as Bosco Verticale. Milano is always been expression of taste in fashion, design and food but, thanks to EXPO, in a different way. A new mentality, a new ethical thinking goes from young generation to companies. Masiero's stand is the proof of all this. The light company brought the Fuorisalone spirit at the oldes Salone by offering two interactive installations: once dedicated to Drylight and the interior that becomes outdoor; the other to the sound of light. Masiero is in armony with this new exciting Milan to live in every sense! The blogger Anastasia Polikarenkova is Masiero's correspondent in Moscow. In the gallery there are her pictures about city's lights and historical lamps of the underground. A mood composition shows a luxury and design inspiration in Russia. Here her reportage about the experience at Crocus Expo. Masiero's stand at Crocus Expo in #‎Moscow where tradition meets innovation and the chandelier becomes an artwork suspended in time that shines in its own light. At the Masiero’s stand at Crocus Moscow, an identity that knows how to be recognized, stand out between every other thanks to Masiero’s strong and marked point of view. Here the Botero abat-jour customized during the Custom Night, the opening night orf the exhibition "Gusto Robusto. Vectorial art prints" promoted by Masiero. These lamps are unique artwork made by Roberto Hikimi Blefari, Maria Grønlund, Francesco Bongiorni and Marta Sorte. A mall food court can be fancy and tasteful, too! GHA Design Studios did a great job in redesigning the Rideau Center in Ottawa. And they’re not calling it a food court but rather the Rideau Centre Dining Hall. It covers 35,000 square feet, includes seating for 850, and features 16 food vendors. For the decorative lighting they have used Flashwood pendant by Masiero, a really cool and organic-looking piece with arms made of natural oak (available with different stains), frosted glass diffusers on the tips and LEDs. Both sizes of the Flashwood were used in this project: the large size, measuring 55" in diameter and the smaller size, measuring 35" in diameter. The Red Door SPA by Elizabeth Arden in Union Square, is a 10,000 sq. foot luxury and indulgent SPA, reminiscent of a beautiful residential NYC townhouse. A real "slice of heaven" in Manhattan. When you access this urban beauty sanctuary, the first thing that catches the eye is the bespoke, matte white chandelier, part of the EVA collection by Masiero, custom made with lights on two levels. On the lower level of the SPA, at the reception desk, you can enjoy also a nice installation of the DORÈ ceiling lamp in the gold finish. To all the lovers of lighting and SPAs in New York city, we just gave you a few good excuses to go visit Red Door Spa! To all design lovers, the project has been specified by TPG Architecture in NYC. From 8th to 12th October, MASIERO lamps made the "25th Dinard British Film Festival" shine. On the stage together with the jury’s president Catherine Deneuve, in the main room for the gala dinner, and on the red carpet with the stars, Eva, Drylight and Libe brought MASIERO style under the spotlight. Lovely beached, celebrities from the jet set and MASIERO’s glamor touch. These are the ingredients that made the TWIGA a must for summer 2014. The open-air nightclub and restaurant on the beach of Forte dei Marmi (Twiga Beach Club) and the most exclusive club in Principality of Monaco (Monte Carlo Twiga) were lit up by DRYLIGHT® floor lamps. Atmosphere of a thousand and one nights, made possible by the innovative technology that provides a lighting system resistant to every weather condition and to sea mist, but with the unique MASIERO style. Mosca hosted with the usual enthusiasm the news from MASIERO at the fair “I Saloni Worldwide” from 15th to 18th October at the Crocus Expo Center. In addition to the news of Classica and Eclettica collections, as first preview for the Russian market, the innovative DRYLIGHT® collection has be presented. It’s a range of outdoor venetian style lights, with IP65 certification, an international patent by MASIERO. The event in Frankfurt (March 30 - April 4 2014) turns out to be once again one of the most important and challenging international fair. MASIERO has carved out a leading role thanks to the official presentation of the new line DRYLIGHT®, with a booth focused on an installation that recreated a summer shower in a garden decorated in a Provencal style. The magnificent chandelier DRYLIGHT®, a creation that brings back to the Venetian tradition, is the result of the union between style and technology, with innovative materials and an international patent IP65. A green lawn in the rain with a shower from the ceiling of the booth, wrapped the visitor in a romantic and charming atmosphere, offering the typical setting for which DRYLIGHT has been developed. Alongside this installation, MASIERO also unveiled four new families from CLASSICA and ECLETTICA collections, which captured the attention along with BOTERO, exposed for the occasion with an innovative shiny chrome paint finish. The fair "I Saloni WorldWide Moscow 2013", just ended, gives to MASIERO new ideas to look at the future of export with sincere enthusiasm. As usual, the event was a front rank showcase for high level Made in Italy, characterized by skilful craftsmanship and top quality materials. And in this plane MASIERO was reconfirmed among the leaders in the decorative market, appreciated from the demanding and ever more relevant target audience in the Russian market and in the market base of the former Soviet Union. The feeling can only be positive, considering that the MASIERO space was among the most visited of the event. The classic soul of the company has been presented in a contemporary context, dominated by the white color, where the atmosphere was heated by the elegant accents of a damask wallpaper. The external showcase, on the other hand, was devoted to the ECLETTICA collection, with emphasis on the new colors of BOTERO, on the wood texture of FLASHWOOD and LIBE, and on the timeless beauty of colored crystal by OLÀ in new gold-leaf and silver-leaf finishes. After the excellent financial results recorded by MASIERO in the first quarter of 2013, the 52nd edition of Euroluce brought a fresh wind of optimism and great motivation for the future of MASIERO. LIBE and DROPOP, the new proposals of the ECLETTICA collection, together with the two new CLASSICA families 6160 e 6190, in fact, have been really appreciated both by agents and customers and by journalists of the major magazines. "We have seen a significant intensification in the incoming flow of public at our booth" said Enrico Maria Masiero, CEO of the group, "but also a very high level of interest, evidently stimulated by the excellent work of research and development carried out in early year. " The commitment of MASIERO has indeed materialized in innovative products using new LED technology, made with eco-friendly materials such as natural oak wood. All in the name of modern and functional style, but at the same time customized according to customer needs, that has always been the key to success for MASIERO.